Barbaric is held prisoner by the M.M.M.S. which is headed up by Dr. Verlag who takes pleasure in mocking the fate of the hero. They had not come to Chicago specifically to retrieve Barbaric and Ricochet but rather to take advantage of the huge population of super-freaks in the city. It was a lucky coincidence that the two fugitives were living in Chicago and the M.M.M.S. took advantage of this fact by pursuing their vendetta against them. The Freak Force headquarters is all but empty now and SuperPatriot is getting ready to leave this part of his life behind. Rapture is annoyed that he is quitting so easily, especially as several of their teammates are missing and may need help. Horridus asks the pair what “subliminal” means after looking through the computer that Chelsea Nirvana had operated. They discover that the machine had been sending out subliminal messages to sew discontent amongst Freak Force, leading to them falling apart. A new proposal is made by the Inhabiter regarding his plans with Chelsea, an idea that does not go down that well with his girlfriend. It is suggested that the M.M.M.S. be taken down by the two villains but Chelsea does not care about the fates of super-freaks. The Inhabiter points out that the prisoners of the slave camp are a ready made army. Chelsea is left weakened by giving the Henchmen their powers and recruiting an army would provide her with more resources whilst she recharges. The guards at the M.M.M.S. are handed Barbaric to vent their frustration over the injuries that they suffered at his hands when he escaped alongside Ricochet and the Inhabiter. 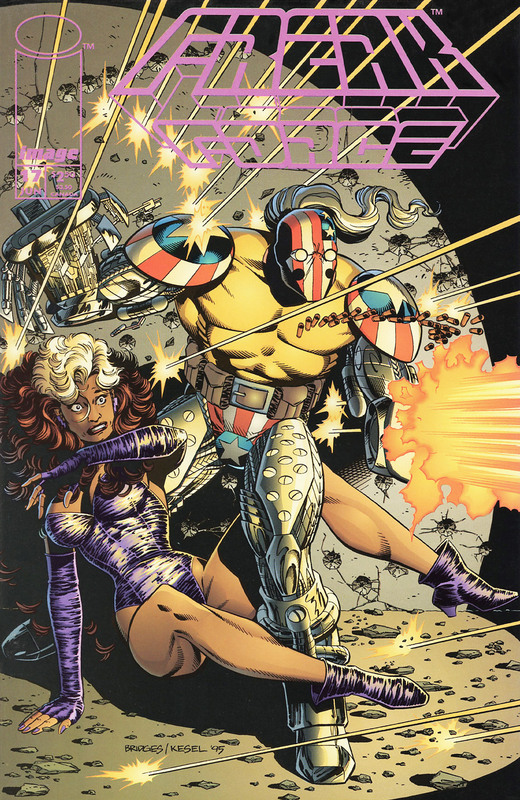 He resists interrogation but is handed over to several villains that he had helped put away as part of Freak Force. They are instructed not to kill the hero but are allowed to have some fun by beating him. Chelsea is informed that in order to lead a successful raid upon the M.M.M.S. then they require a field leader to pull off the victory. She is hesitant to commit to this idea but the Inhabiter leads her down to the basement where Dart is being held. Dart is asked to lead the liberation attempt but rejects the offer at first. Ricochet is then brought down to see her and the teammates discuss helping their enemies in order to rescue numerous enslaved super-freaks.